Cooking or pottery may not be regarded as ideal career building options. However, taking part in these after-work hobbies do have a considerable impact on a person’s office performance. Having such hobbies can help you create a positive impression on your prospective employers and may enhance their mood and improve your confidence. It will minimize stress, offer networking opportunities and enable you to coordinate in a better manner with others. Dr. Kevin Eschleman, an assistant professor of psychology at San Francisco State University has conducted deep research on the relation between hobbies and job performance. 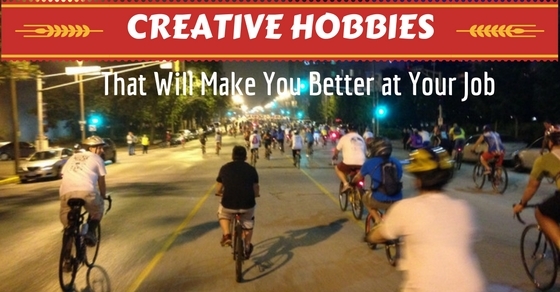 In his study, Dr. Eschleman found that hobbies offer a diversity of advantages which extend to the office. Moreover, his latest research has found that the less significant the activity to the person’s profession, the greater the impact on his or her office performance. Even if you are not a naturally gifted painter, you can take a painting brush and try your hand at painting as a pastime. Most people have repressed emotions that they are unable to vent through words or expressions. Painting is a great way to reveal such emotions that have been held back. If you are overstressed or worked up, you can simply take a painting kit and paint a warli art or small sketch to reveal your emotions. If you lack confidence in your painting skills, you may just opt for a colouring book that you may use as a stress buster. A half an hour break can have a great impact on your mental state. Any simple craft requires patience and creativity. It is easy to learn to make things but a small mistake can ruin the entire attempt. Be it preparing a simple earring using quilling strips or preparing beautiful models using modelling clay, everything requires you to stay calm and confident. There are truly no shortcuts to success, however old you grow. This applies even to our work life. Our seniors know well because they have learnt secrets of work from their past work experience. Before frustration gets the better of you, keep in mind the fact that these people are highly experienced. Once you have a clear idea about the project you are dealing with, you might be in a position to discuss on adjustments and improvements, but as of now, follow their instructions. Once you have a clear perception about the background of their projects, you will be in a situation to discuss on making adjustments and improvements. You may think that it is no great deal to sow a plant and see it grow. This is far from the truth. A living needs much more than just water and sunlight. It requires the perfect environment ale conditions to grow. It also requires determined effort and care from your end. As anyone who has ever tried it will know, it is impossible to grow a flourishing garden overnight. The same logic is applicable in case of your job. Sometimes, you may have to use a similar philosophy while getting a task accomplished. You need to work to achieve the goals whole staying determined even in the worst trade situations. Knitting may seem like a girlish art that anyone can master. Women often make attractive things by knitting while sitting at home. People think it is easy but it involves great patience and repeated effort in the same manner. It is a good exercise that helps you to learn better concentration. You may use your skilł of knitting to decorate your little office space. This is one skill that helps you destress. It also helps you give a new look to your little cabin. A decorated office cabin helps you feel de stressed and relieved. It helps you develop better effort taking skills that is sure to help you in your future career. Some people enjoy decorating. Be it a small cake slice or an office cabin, they enjoy decorating it. These are people who are extremely organised and have a keen eye for aesthetics. They are best for careers like interior decoration, event management and fashion designing. They may even take up careers like consulting and management. While decorating may just be a hobby, it may eventually turn into a habit that helps you keep your spaces more attractive and relaxing. Dancing is a common hobby among a sizeable section of Indians. This is great news for people on the job as dancing improves brain power. By learning new dance methods, you can activate the motor center of your brain and in turn create new neutral connections which enable you to think quickly. The faster you can think, the quicker you will be able to solve issues. You can also communicate your thoughts in a better way than you would have done otherwise. This is an activity which Eschelman believes will enhance your overall work performance. Maren Showkeir firmly agrees to his view. While being associated with the Arizona Republic in the late 90’s-which was a highly stressful time to be in the print industry-she started practicing yoga in order to cope up with her highly challenging work schedule. Showkeir is of the opinion that yoga has taught her an important virtue which is commonly accepted among musicians-that while practice makes a person perfect, perfection is unattainable. Musicians are well aware of this fact. Therefore, they never cease practicing. Practice forms a part and parcel of their day to day lives. Over a period, they attain a wide range of skills which can increase their workplace performance. By learning how to play a musical instrument and becoming a musician,you tend to develop good listening skills, experimentation, high level of self-discipline and successful collaboration. It is almost impossible to be an accomplished music professional unless you master specific theoretical concepts and improve your presentation skills. And ultimately, attaining originality comes once you get over the fear of failure with a desire to acquire a new vision, a fresh perspective and an exceptional voice. In his study, Eschleman also found advantages of volunteering that can offer a more widened perspective and a sense of community. Anything which offers you with an actual shift as to how you see the world will prove to be an advantage for your health and happiness. It will also resolve your problems, both at the personal and professional level. By contributing to an important cause, you can improve your leadership and networking skills and fill you with a sense of empowerment. By working on social welfare projects with a community, you will be accepting the fact that you are not an introvert person. It offers you with a new perspective and enables you to potentially bridge gaps about whose existence you didn’t know. Another method you can adapt to improve your collaboration skill is by taking part in competitive team sports. Team based games can help you acquire work related benefits that you can gain while visiting the gym, court, track or swimming pool. As an employee, you can train an employee on the daily requirements. But you cannot make the person change his or her work ethics. People with a sporting background already have that level of dedication. Sportsmen have a sense of resilience and are efficient in managing their time. They can work well with others and develop strong communication skills. They work really hard in order to achieve their goals. Though it may seem funny, institutes which offer improvised comedy classes teach students about how to collaborate, think out of box, create ideas ad express their creativity without any fear of ridicule. It can help you acquire skills for your workplace. While you improvise, you are always listening. Sandy Marshall, vice president of Second City Communications is of the view that one of the major keys to improvising, listening. You build a good synchronization with your scene partner’s directions. Second City Communications offers makeshift comedy classes for more than half of all Fortune 1000 companies. Individuals normally take improved classes on their own and with companies. People participate in improve classes individually as well as with companies. This helps them attain a high level of confidence to attend sales presentations, client meetings or customer service. Photography is a pastime which is partly a hobby and an artwork. If the photos which you take are more artistic, then it is highly possible that you will be the person who will be taking pictures of major events taking place within the office. Though most people take pictures every now and then, only a handful of them are really good at it. You can also have a considerable side earning if you are a good photographer. There are a number of websites such as Flickr which provide photos to different users across the web. You can also consider creating an account on Flickr and adding your pictures to sell to potential clients.